The first thing I noticed was the diagram on the left hand side – a copy of the official Nizhny Novgorod Metro network map. Network map via AlexTref871 on the Wikimedia Commons. This provides a little insight into Russian culture – apparently buying a fur coat or a big wedding with borrowed money isn’t considered outlandish! 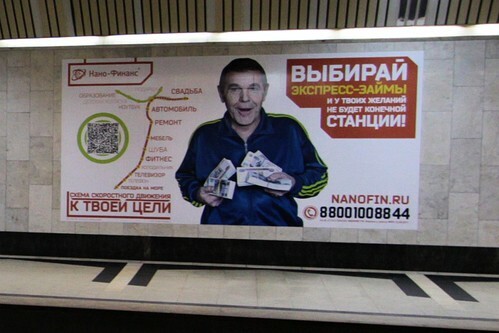 This entry was posted in Everyday life and tagged advertising, metros, Nizhny Novgorod, payday lender, Russia. Bookmark the permalink.